This week, we’re featuring a workout from the training logs of Team Gregg. These days, husband and wife Brian and Caitlin Gregg are adjusting to life, training and bodily changes as Caitlin is pregnant with their first child (a girl), due in early February. Read the full story here. 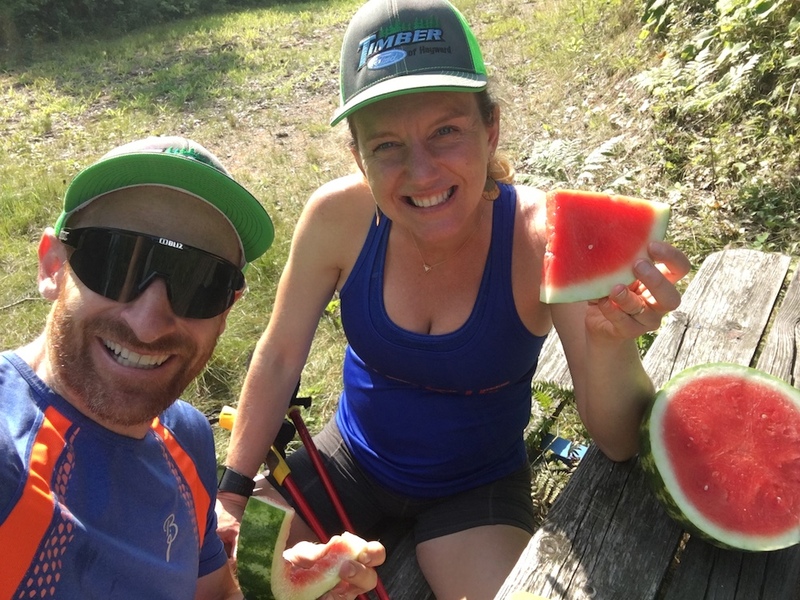 Caitlin sent us the following “trailheading” workout, in reference to starting and ending a workout with someone else, which is how they often train together. 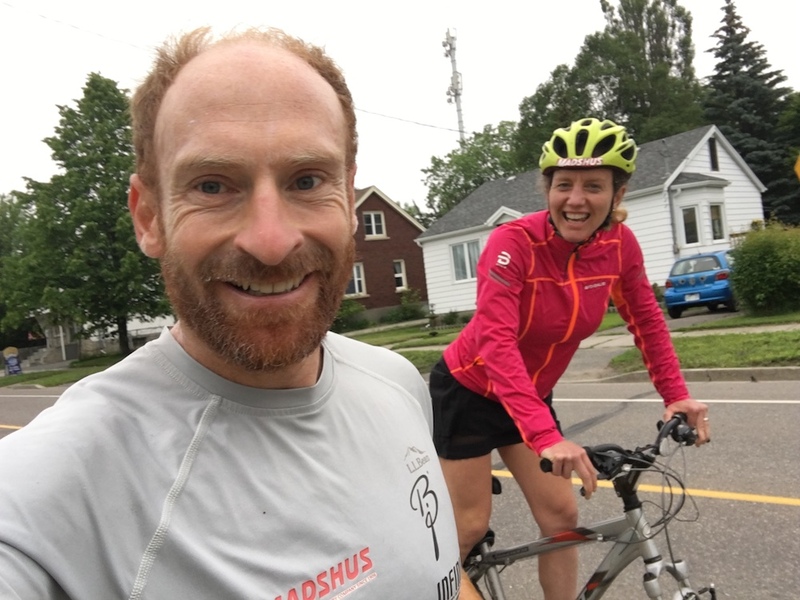 One of the challenges in training and racing is that it is often challenging to find training partners at the same speed and ability as yourself. I would argue that the best training partner is one who is just slightly faster than you. Brian and I have been blessed with opportunity to be a married couple who have both competed in the Olympics. Every training partner can offer something and we enjoy large training groups. If you don’t have a training group, take it upon yourself to organize one. Utilize a loop so that the group can kind of stay together. If you are really searching, our neighbor’s house is for sale and you can join one of the many each cross-country ski groups in the Twin Cities. Utilize different ski speeds as equalizers. On snow, put the slower person on the fast Redlines. If you are rollerskiing, give the person who is in the best race shape the slow, soft wheels. Using various rollerski wheels is a great way to prepare yourself for various snow conditions. Another tool we use is a weight vest. For intervals, Brian will wear a weight vest and we can ski side by side pushing each other. This summer, I had Brian carry a watermelon during a hike so that we could relate, plus it was delicious. In preparation for the 2015 World Championships, at 9,000 feet in Colorado we would Jetstream bloc my skis so that I could be skiing at speeds more similar to sea level. Plus, Brian and I could do intervals together. Although Brian and I might have the same duration for an interval, he will start behind me with the goal of trying to catch me by the end while my goal is to try and hold him off. This also works really well for speed sessions. We have a great hill in Afton, Minnesota, that Brian and I try and get out to about once a week in the fall. It’s steep and long (for the Midwest) but you can also safely ski down between repeats. Warmup: Ski easy for 30 minutes with 15- to 20-second pickups. We usually start our warmup at the same time, but gradually over the 30 minutes, we separate and meet up again to do some pickups. We then do a set of pickups where Brian starts behind me and we try to finish the pickups together. Intervals: The workout is usually 5-8 x 4-5 minutes (with 3-4 minutes recovery) depending on how we are feeling and what our goal for week is. Brian will either put slower wheels on or wear a weight vest for the session. I will either put faster skis on or start a little before him. The Game (Goal): If it’s just the two of us, we try and make the intervals more fun and exciting by challenging each other to get to the top first, but also try to maintain or drop our times from the start of the session to the end. For example, getting to the top first on the first interval but then falling back or skiing slower each subsequent interval isn’t the goal.We focus on negative splitting each interval in the set, which requires good discipline early on. Cool down: We usually ski the cool down together and reflect on the session. Since we are out there together, we don’t always have feedback the way someone watching or filming the entire session from the sidelines would, but we can still be observant of how the other person is moving and offer some technique cues.